On October 2nd, 2012 at the stroke of midnight one of Disney’s most magical classics is yours to own on Disney Blu-ray/DVD Combo Pack as the newest Diamond Edition. 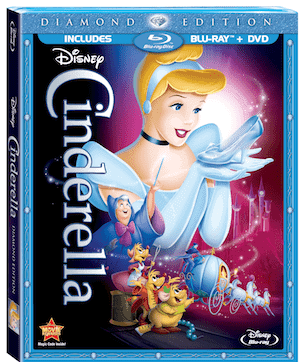 Experience Cinderella as you never have before in Blu-ray high definition with updated picture and sound. This Disney classic sparkles! Adapted from the Charles Perrault classic, Disney’s Cinderella is the story of a young girl named Cinderella (Ilene Woods) who has become a slave in her own home to her stepmother, Lady Tremaine (Eleanor Audley), and her two daughters, Anastasia (Lucille Bliss) and Drizella (Rhoda Williams). Cinderella dreams of another life for herself, but meanwhile does all of the housework herself without complaint. When a messenger from the King (Luis Van Rooten) arrives inviting all eligible maids from the kingdom to a ball in honor of Prince Charming’s homecoming, Cinderella is eager to attend. Though her stepmother agrees to bring her along with them to the ball, she does everything in her power to make sure that Cinderella does not go–even pitting Cinderella’s stepsisters against her. When all hope seems lost, Cinderella’s fairy godmother (Verna Felton) arrives and helps all of Cinderella’s dreams come true. I can’t remember a time when I did not know the story of Cinderella, and most importantly, the Disney version of it. As a child, I owned it on VHS and played with a 12” Cinderella doll that I received as a Christmas gift one year (and yes, I still have that doll.) As an adult, I bought Cinderella on DVD when it was first released to keep up with the technology of our times, and now I am delighted to bring the Blu-ray into our home. Just like her mother, Zoe is a huge fan of Cinderella. It just may be possible that she has now seen Cinderella more times than I have. My husband has put her favorite films on our extra iPad for Zoe to watch any time that she would like, and I know I have walked into her room numerous times to discover that she is watching Cinderella yet again. This beautiful fairy tale has sparked her imagination and is close to her heart. Personalized Digital Storybook: Bibbidi-Bobbidi-You Download the Disney Second Screen for Cinderella from the App Store (if you have an iOS device), or you can also download it from Disney Second Screen. The Blu-ray will tell you to search “Cindy Book” to find the free app, but it didn’t find any search results to match this. Instead, search for “Disney Second Screen Cinderella” and it will pull right up. Cinderella’s Fairy Godmother will interact with your child–even saying his/her name–through Cinderella themed games and a storytelling experience. Tangled Ever After This is the Tangled short that debuted in theatres before Beauty and the Beast 3D. In this short, Rapunzel and Eugene/Flynn Rider are getting married and couldn’t be happier. During the ceremony, Pascal and Maximus lose the rings and have to find them before the ring exchange. If you’re a Tangled fan, you will not want to miss this! Classic Deleted Scenes are introduced by Don Hahn, including a new work song (sung by Cinderella) and a different love song sung between Prince Charming and Cinderella. The different work song has been re-recorded for this feature. The different love song is set to the original concept artwork, which involves the prince and Cinderella dancing on the clouds. Classic Music and More features the original demo recording of the Cinderella title song, 7 songs that were cut from the film, and radio shows from 1948 and 19950 that promoted the film. The Real Fairy Godmother is a feature that talks about the studio’s difficulties in finding the right look for the fairy godmother. The daughter (JP O’Connor) of the animator who drew the fairy godmother talks about how her mother (Mary Alice O’Connor) was the inspiration for her father, and also became to be known as the “Fairy Godmother of Burbank” because of all of her community service efforts. Behind the Magic: A New Disney Princess Fantasyland Once Upon a Time’s Ginnifer Goodwin takes us behind the scenes of the new Princess Fantasyland in Walt Disney World that is opening in the fall of 2012. The new Fantasyland will contain attractions such as the Beast’s castle (there will be a restaurant in the ballroom! ), Snow White’s Forest, Prince Eric’s Castle, and so much more. The Magic of the Glass Slipper: A Cinderella Story This is a very clever, artistic introduction to Christian Louboutin’s Cinderella inspired slipper. Louboutin co-wrote and starred in this short film, which is its own Cinderella story. Alternate Opening Sequence Much of the original concept art from Cinderella is now housed at the Disney Animation Research Library. This art shows an early idea for a different introduction to Cinderella. How fun! What a great review – Cinderella has always been one of my favorite and hopefully as my daughter gets older it will be hers too! Cinderella was always my favorite! I’m debating wheter or not I need the Blu-Ray if I already have the special DVD version. I just turned 25 yesterday and I still watch this on a regular basis and sing along like I did when I was 5 lol. One of Disney’s greatest films. Cinderella is still my favorite can’t wait. This movie is one of our favorites. I’d love to see the deleted scenes. My daughter will be so excited! Cinderella is her favorite of the Disney Princesses 🙂 I can’t wait to see it again! My niece loves Cinderalla, so I might just have to pick this up for her. Thanks so much for sharing. Thanks for the review Jennifer. My favorite part of Cinderella is her relationship with her furry friends. Every time I watch it with my nieces I think I giggle more than they do. I remember watching the movie when I was a little and like most children I loved to daydream that one day I might meet a prince. I’ve seen the story remade, because the perfect fairy tale never gets old and every one likes to believe they will find true love, despite all odds. Having seen the original made me question whether seeing the film again on Blu-ray was necessary, but coworkers of mine from DISH who know my love for Disney movies have said the Blu-ray version is worth seeing. My passion for buying movies is sweet and sour like the drama behind the camera; I love the smell of a new Blu-ray, it’s an addicting, but expensive habit. The decision to start renting from Blockbuster @Home has given me the freedom to save a lot of money, but the best part is that I’m watching a lot more movies than before. If Cinderella turns out to be all everyone says it is, I might have to make an exception this one time.